Dr. Raman Singh (born 15 October 1952) is an Indian politician and is the Chief Minister of Chhattisgarh state since 7 December 2003. He is a member of the Bharatiya Janata Party. Dr. Raman Singh was born on 15 October 1952 in a Rajput family. His father being Vighnaharan Singh Thakur and his mother, Sudha Singh. He is a doctor of Ayurvedic Medicine and is married to Veena Singh. His son Abhishek is a qualified mechanical engineer and currently serving as Member of Parliament from Rajnandgaon constituency and his daughter Asmita is a practising dental surgeon. Raman Singh is a member of the Rashtriya Swayamsevak Sangh. Dr. Raman Singh joined the Bharatiya Jan Sangh as a youth member and was the president of youth wing in Kawardha in 1976-77. He progressed to become a councilor of Kawardha municipality in 1983. He was elected to Madhya Pradesh Legislative Assembly consecutively in 1990 and 1993. In 1999 he was elected to the 13th Lok Sabha from the Rajnandgaon constituency in Chhattisgarh. In the government of Atal Bihari Vajpayee, Singh became the Union Minister of State for Commerce and Industry from 1999 to 2003. He was later named as President of the Bharatiya Janata Party (BJP) in the new state of Chhattisgarh, and led the party to a victory in the 2003 state Assembly elections. 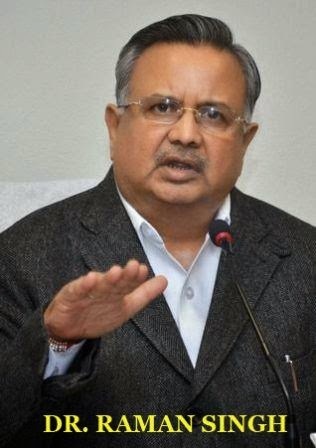 With the other main contender for the Chief Minister's post, Dilip Singh Judeo, caught in the midst of a scam, the BJP leadership named Dr. Raman Singh as Chhattisgarh's second Chief Minister, and the first person to be elected to that post. He has received praise for his organizational abilities, as reflected in his state's position with regard to implementation of a programme to improve the conditions of Scheduled Tribes and Scheduled Castes. The United Nations has also recognised the work done in Chhattisgarh under his leadership and the fiscal management of the state is another aspect for which he is known. He banned naxalite organisations in Chhattisgarh in 2005 under the "Salwa Judum" initiative, a move supported by the opposition party as well, led by Mahendra Karma who was assassinated by naxalites on 25 May 2013. Dr. Raman Singh was sworn in for his second term on December 12, 2008. On 8th dec 2013 he has been re elected as the chief minister of the state. He successfully won election 2013 for his 3rd tenure as a CM of Chhattisgarh.